This post is really a play on words. It's not as literal as the tittle sounds and I am certainly not promoting eating for comfort, gosh knows I've made to much of that mistake lately. I am going to share some insights I have found in Pastor Steven Furticks book "Crash The Chatterbox" The insights are not mine but the relating to it certainly is. I have been asking the Lord to give me a verse or verses to arm me for battle during this time in my life. As excited as I was and am about our move to Charlotte, I have discovered that I really don't handle change well. Even welcome and desired change. My personality shrinks at new and first time experiences. It is so uncomfortable for me to start from scratch. Relationships don't come easy to me. They take time to develop. I have been in a major relationship drought too for far to long. I am so ready to do some life with people. To share good and bad and hold each other up. But I know this is going to be a process that will take time so most activities and outings are still uncomfortable . Then there are other areas and relationships in my life that are changing just because of where they are in life. Little boys are becoming men and that has spun me through a loop. The fear of losing something that has been so utterly precious and dear to you, so much that it is irreplaceably valuable to you, is monstrously daunting. On some levels I felt ambushed, because I wasn't expecting some of these changes, at least not right now with everything else new that is going on. And when you don't really know what to do with yourself or these intense emotions you retreat. You want to just crawl into a cave and not face it all. It feels too BIG for you. It feels like you can't make it. The noise of what is so hard is deafening. So I cried out to Jesus and if you know me, you know there were MANY MANY tears. So many times God speaks to me as I am reading. It really is my favorite way that I hear from him. So I picked up my book, Crash The Chatterbox, and once again heaven opened up and poured out just what I needed for my fearful heart. Let me share with you some of what pricked me as I read recently. "Fear often finds power, not in our actual situation, but in what we tell ourselves about our situation." I don't know about you but I can sure wind myself into a tizzy. 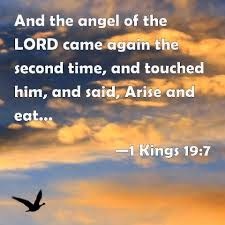 "The angel of the Lord came back a second time and touched him and said , Get up and eat for the journey is too much for you." Pastor Furtick went on to explain how God did not give Elijah what he asked but he did find him in his fears and spoke to him not with threats but with reminders of his care. What did I love about this verse? First of all I loved how the angel came back a second time. This reminds me of Gods faithfulness. How he pursues me even when I am running away. I also loved how Elijah was given what he needed for the journey. I had been in a spot of just not knowing what to do and terrified that I would do the wrong things. I felt this was my verse. This is what I am to do. I am to feed my faith. God has provided an amazing church, his word, people, books and on and on as my buffet. Then a great wind came followed by an earthquake, and then some fire. And as the word says "after the fire came a gentle whisper." Maybe you are like me and you can feel so bombarded by fear, that the noise of it is just so loud that "the enemy's threats deafen your spirit to God's reassurance." So why did God call Elijah out on the mountain? Because "on the mountain the signal is stronger than the noise." and he whispers because he is close. How beautiful is that? I mean I am sure I am not the only one who has ever been frustrated by the noise and the whisper. You want God to yell louder than the noise but isn't that better? Isn't it better to be close? I love that. So I wiped my tears and I blew my nose and I sat there resting in the peace that comes with His closeness. The signal was clear. And my spiritual belly was full. Thank you Jesus for coming back to me no matter how many times it takes and thank you for providing me with just what I need to feed my faith and thank you for calling me out of the cave I hide in so your signal is loud and clear. otherwise I know it will be as the word says too much for me.